My name is Mashudu and in our Tshivenda language this word means “blessing”. Eni is my mother. I started embroidering when I was still in high school. Nowadays I embroider and I collect all the finished embroideries and check quality. 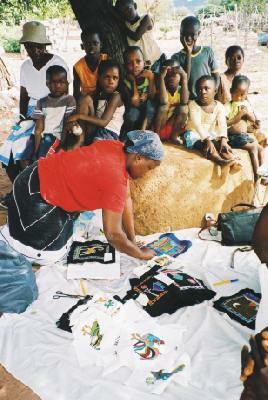 Once a month I pack all the embroideries and early in the morning at about 4 o’clock I take a small bus to Sibasa. There I buy a ticket for the TransState bus to Johannesburg. We all sit under a large blue gum tree waiting for the TransState bus to come. At eight o’clock the bus arrives and then we grab our luggage and get into the big bus. It is a long journey to Johannesburg. At about 4 o’clock we arrive at Park Station in Johannesburg and there Ina waits for me and we go to her house. I have one child, Aluwani, he is nine years old and goes to the local primary school. Often people ask us: “Why do you live in this dry area? Move to the cities where there are more opportunities and jobs and entertainment?” Our lives here are very simple; we have no electricity and no running water. The cities frighten us. 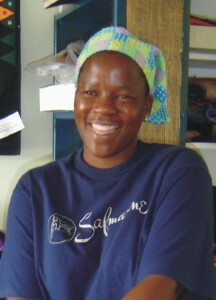 Ina: Mashudu is very good at quality control and knowing how much yarn is needed for an embroidery. Now that I live in Napier at the other end of South Africa we use the postal service. All the embroiderers now have bank accounts and they are paid by direct transfer which is much safer.